Gov. 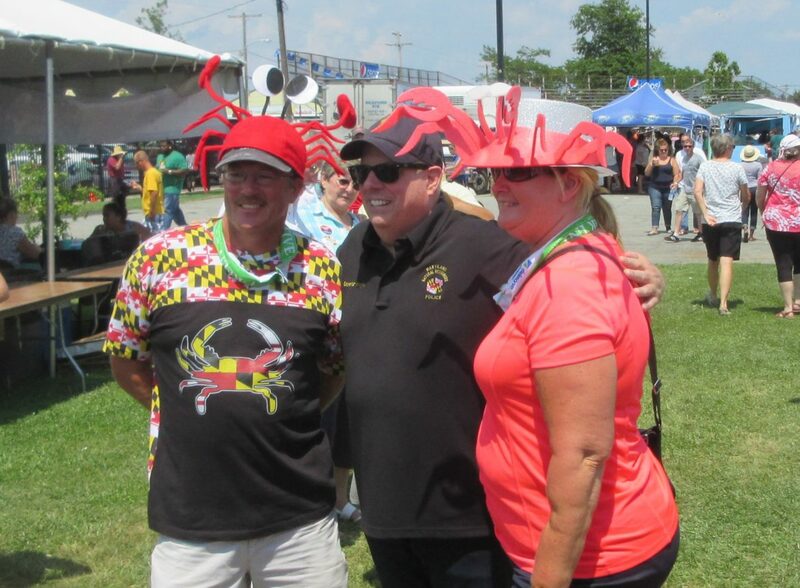 Larry Hogan poses with couple in crab hats at Tawes crab feast. Lobbyist Bruce Bereano and Gov. Larry Hogan point to the welcome sign above the entrance to Bereano’s circus-size tent. There were several welcome signs around Crisfield for the governor. It took Gov. Larry Hogan about two and half hours to drive 126 miles from Annapolis to the Tawes Crab and Clam Bake in Crisfield, and then it took him another two and half hours to go about 100 yards from where he arrived to the Bruce Bereano tent. “It was unbelievable,” said the governor as he finally got to sit down and eat some fresh picked crab with crackers and cream cheese. Every step of the way he was mobbed for photographs, selfies, in pairs and foursomes, people pulling out their phones and tablets to get a shot with the popular governor, as a campaign production team recorded video. Every time Hogan tried to break free, someone else would stop him, to chew his ear, raise an issue or just shoot the breeze. He said he genuinely surprised by the warmth and enthusiasm. Other than the scrum around Hogan, the crowds seem thinner this year, though the circus-size tent hosted by lobbyist Bereano was packed as usual. In this presidential election year, there are few races on the ballot, and fewer politicos made the long trip to the tip of Maryland’s Eastern Shore. Here’s a sample of those who did show. Comptroller Peter Franchot, left, also visited the Bereano tent. Hogan and Montgomery County Sen. Cheryl Kagan share a conversation. Environment Secretary Ben Grumbles and Secretary of Labor, Licensing and Regulation Kelly Schulz. Secretary of Higher Education Jim Fielder and Hogan Appointments Secretary Dennis Schrader. From left, Hogan Legislative Officer Chris Carroll, former delegate Bill Frank, Del. Susan McComas. Dawn Jacobs, Ray Godrecki, Del. Jay Jacobs. Del. Kathy Szeliga, the Republican nominee for U.S. Senate, hears from Maryland Secretary of State John Wobensmith. Rep. Chris Van Hollen, Democratic nominee for U.S. Senate, talks with attorney Bob Douglas. From left: Sen. Wayne Norman of Harford County, a Norman ally, and legislative aide Hilda Foster. Attorney General Brian Frosh talks with Del. Ben Kramer of Montgomery county. The Somerset County Republican Central Committee was handing out Trump signs. Most were taken in half an hour. Howard County Executive in conversation with Anne Arundel County Council member Jerry Walker, and Md. Planning Secretary Wendi Peters. Attorney Len Lucchi with retired judge Gerry Devlin. Se. Jim Mathias represents the lower ‘Eastern shore. The finale: Multi-layered Smith Island cake.